Most of us don’t get enough vitamins and minerals in our daily diet. In fact, less than 5 percent of Americans follow all of the recommendations in the USDA’s Dietary Guidelines. But dietitians say it’s better to get all of your vitamins, minerals, protein, fiber, and other nutrients from food. That’s because foods such as vegetables and fruits have benefits that a pill can’t offer. They include fiber, phytochemicals (plant chemicals), and a balance of nutrients and disease-fighting antioxidants. Your body can only absorb so much. 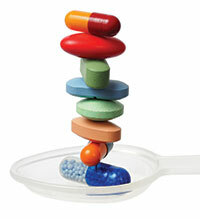 So, if you eat a generally healthy diet, the multivitamin you take might not contribute anything. Focusing on adding healthy components to your diet can help you stay healthy and ward off disease. You can figure out whether you are taking in the right amount of needed nutrients each day in several ways, according to Nutrition Services Director Kathleen Shafer. Find out which nutrients are in the foods you already eat. Take a realistic look at your diet and see what is lacking. Many online resources can help you find out what’s in each serving if the food item does not have a nutrition label. You’re a vegetarian You will want to make sure you have enough calcium, iron and B-12 in the foods that you eat. You can’t drink milk Though low-fat dairy is a cornerstone of nutrition recommendations, if you can’t (or don’t) drink milk, you might also consider a calcium and vitamin D supplement. You get limited exposure to sunlight Your body needs sunlight to develop vitamin D on its own, and people who have limited sun exposure or who are dark-skinned are less likely to have sufficient vitamin D levels. You’re pregnant During pregnancy, your body has increased nutritional needs. Take a prenatal vitamin before you get pregnant and during your pregnancy to ensure that you and your baby get enough of the nutrients you both need; it should contain at least 600 mcg of folic acid. You have new nutrition needs This can happen at different stages of life. For example, women can need more calcium and vitamin D after menopause.